There's not a clean glass left in my house. While I'm sudsing, you might enjoy reading this WSJ article about banana box groceries, also known as salvage food stores. My archives also discuss shopping this unusual resource. So you are going to pick up where you left off without any explanation of what happened? I do not owe readers anything except appreciation. I blog without obligation and will continue to do so until I no longer feel like doing it. That day may come sooner than I thought. Until then, I'll continue to pop on and share our frugal-related news when I can. Surely you will put those dishes in the dishwasher, both to save yourself the labor of washing them by hand (since you have been ill so long you are probably still not up to par) and to assure that they are sterilized (since you have been ill so long). I do hope you are feeling better. Your posts have been missed! You are EXACTLY right. You owe us nothing. While I selfishly hope you continue blogging for a long time to come, I completely understand that you have a life, a family and that your sharing with us via your blog is a gift. I appreciate you and the gift of your blog. Logging in and seeing a new post is like a little present - but certainly not an "expected" one. Thank you for sharing with us! Many blessings to you and your family! Hi Meredith, so good to see you back online. And no, you don't owe your readers anything, but I think that most of us enjoy your blog and we worry when we don't see you post. I hope and pray that everything is ok with you and your family. Meredith, I certainly understand your not wanting to share anything too personal with strangers, but most of us feel like we know you on some level and I guess want some assurance that you are well. I sincerely hope so. Hope you feel better, and look forward to reading more blogging from you. Hope you and your family are feeling better! I battled the flu/bronchitis and it was rough! A question about these lower-priced food stores: Any suggestions on how I can find if any are in my area? I missed you! Yours is the first site I visit whenever I log onto my computer. I hope you are well. Of all the bloggers I read, you are about the classiest. Your eye for beauty has inspired me. All the best. Yes, I also missed your updates, was hoping you were OK. At the same time, I love the "blogging without obligation" concept because I have gone through periods of time recently where I didn't blog for weeks... but since very few people read my blog, it wasn't an issue for me. I do wish there was a food salvage in our area! The closest I get is the damaged shelf or bin at our grocery and sometimes the prices are too high there! I recently found canned tomatoes at Grocery Outlet for 25 cents a can, and bought two cases. Those same cans at the other grocery, even dented would have been at least 40 cents. You are right to only blog when you want. Like others though I was a bit worried, at least the post on Sunday let us know you were still alive. Maybe a taking a break sign next time? Then us worry-worts would feel better. Thank you for all you do here! I thoroughly enjoy your posts. Just at the time we could really use a discount place, there are none. Used to have a Grocery Outlet that was great. Also, I used to buy lots of dairy stuff at EarthFare for practically pennies as it approached it's "expiration date" but, sadly, they now throw it all in the dumpster. So, my way of saving is to buy nothing boxed except oatmeal and no frills either. Glad you're back Meredith. U-R-A blessing! Welcome back Meredith and thanks for the new topic! I can't seem to find a salvage store in our area, but Dollar Tree sometimes has great buys on food items. I also found that our local grocery chain had some boxed food products for half the price of others stores, which was a great deal. If you don't have an area salvage store or bakery, just keep your eyes out for great deals. They are out there, you just need to know when you see one!! BTW did anyone see the segment on Oprah a couple weeks ago about "freegans"? I'm ready to go dumpster diving for some of the deals they found! I am sure the majority of readers have care and concern in their hearts for you and your family . We are appreciative of your Blog and are happy that you and your family are well again. Meredith, you are a sweetheart to not just block that mean spirited person. You owe us nothing, if anything it is us who owes you. You give of your heart with your blog, sharing your eye for beauty in the mundane things around us. I have come to enjoy seeing your son and daughter doing the sweet things children do. Thanks so much. If you do not want to blog any more, I understand; I will miss it so very much though. I do understand that you have to do the best thing for your family and your self. Oh, Meredith, you're back. I'm so happy! We will take whatever you have to give us and be very thankful for it too! I missed you so much though. However when I visit my IL's I always make sure to stop at BB's Grocery Outlet in Newburg Pa. It's so much fun! I stock up on various gourmet tomato sauces for around.75 a jar and cans of chickpeas priced at 3/$1. It's a great store thats owned and ran by the Amish. Meredith-I'm glad you are back and that your family is well. God Bless! I am so thrilled to see your posts again. How I have missed your beautiful pictures. Your blog so lightens up my day. But I must admit, it is the pictures of your dear children that really touchs me. I have none of my own and so enjoy yours. You have made this world a better place and if there is a regret, it is that I have never met you or your family. but still feel I know you better because of your blog. I can't thank you enough for sharing your life with us. So glad to see you back! I am a daily luker, and I have missed you. I love your topics, writing style, and you are an inspiration to me. You make me want to work harder for my family - thank you! Yeah. When I do the $6 box sale every other Saturday morning at 9am, we also use banana boxes! I love it! I can hardly wait for the next one. You can't beat a sale where in you can buy any and everything you can fit in that box for only $6. I used to get diapers before potty training AND than tons of groceries! You can't buy a pack of diapers alone for less than $6. So It's well worth the trouble of the crowd and the unusual toting of the box. I'm adding my voice that you DO blog for a long time! Amelia's seems to have some inventory that I can count on, but also some random bargains. I buy yogurt when it's 4/$1 and bottled (shelf-stable) juice for .99 for 64 oz. of 100% juice. Can also get free and clear laundry detergent for $3 for the standard size (compared to almost $7 at my grocery store). I've bought boxes of Grape-Nuts for $2 a box and organic mac n cheese for .50/box. I'm very blessed to have a store like this so close to me! Like other readers, I was worried. I'm glad to know that things must be even slightly better or you wouldn't have posted. You should definitley put you and yours first before any blogging. I do admit to being curious as to what happened but I realize that you do not owe us anything. God Bless You & Keep You! Glad to see that you are ok. Not blogging is great! It shows you have a real life like the rest of us. I understand, and I have not posted any new posts on my blog as well. Taking a breather is what is needed as things have been hectic here. My four kids have battled super high fevers, sore throats, bad moods, and couch plopping. I am wiped out and don't feel like blogging lately. On another note, I love the Discount Food Store!! I go there once a week and it definatly has saved us money. I wrote about it last Frugal Friday on my blog. Glad to see you back! I think anonymous up there is the same person who was causing trouble over at Mrs. Wilt's blog and Sallie's blog when they took a bloggy break. I know that folks feel like they 'know' you on a level, but really, a blog is nothing more than an online journal, without quite so many personal thoughts. You owe us nothing, and vice versa. Yes, I worry about the safety/health of some of my favorite bloggers if they disappear, but I understand that they've got homes, families, and stuff going on in their lives just like I do. I always wish that person well and pray for their well-being. As far as banana box stores, we don't have 'em here in Wisconsin. :( You can hit up Dollar Tree for deals, but that is about it. I stick to Aldi and couponing for my deals. 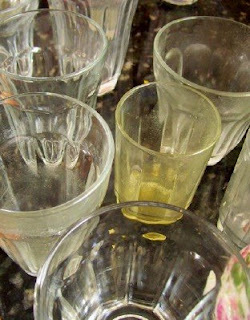 And I can't believe you have such pretty depression glass!! Mine is never used - I keep it locked up in the secretary for show. My grandma had a huge collection, and it is all, besides happy memories, that I have left of her, so I cherish it. Perhaps you could blog about using nice dishes and such with two littles - my son is only 7 months old and LOVES to bang anything and everything. I have a feeling I'll have to switch to Tupperware dishes when he gets older! Many happy returns, my dear! Thanks for sharing the blog regarding salvage stores. I had never thought to see what is around my neighborhood. Turns out there is a Grocery Outlet nearby! I can't wait to take a peek inside. My family just got over the high-fever, respiratory flu that has hit these parts with a vengance. Glad your family is doing better!